Building a China-Latin America community with a shared future is a vital step for human society to overcome temporary difficulties impeding further development of globalization and achieve global prosperity, security and development. Building a China-Latin America community with a shared future is a historically significant proposal offered by Chinese President Xi Jinping. 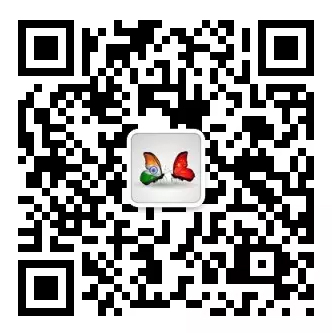 It would represent a vital step for human society in overcoming temporary difficulties impeding further development of globalization to achieve global prosperity, security and development. Xi’s recent state visits to Argentina and Panama resulted in positive outcomes. First, those visits created a better external environment for further development of China-Latin America relations. Even though Latin American countries such as Brazil and Argentina have benefitted from a bump in agricultural exports to China due to trade friction between China and the United States, they are concerned that the uncertainty caused by escalating China-U.S. trade disputes could undermine the world economy. As the host country of the 2018 G20 summit, Argentina hopes that China and the United States will continue maintaining cooperation to safeguard the leadership of the G20. President Xi and President Donald Trump met on the sidelines of the G20 summit in Argentina and agreed to stop imposing new tariffs and solve their trade friction through more negotiations. Through bilateral and multilateral meetings with leaders of other countries, President Xi conveyed China’s stance on upholding multilateralism and opposing protectionism, which received applause from various parties including the United Nations and BRICS countries. Moreover, the joint declaration signed by all G20 nations endorsed “necessary reform” of the World Trade Organization (WTO). China contributed its efforts to the success of this year’s G20 summit, injecting stability into the world economy. Secondly, Xi’s visits lifted China-Latin America pragmatic cooperation to a new level. Although Argentina is suffering spiraling financial turmoil, China still has confidence in the development prospects of Latin American countries including Argentina, evidenced by its pragmatic cooperation with those countries. China’s investment in Argentina in areas such as energy and infrastructure as well as a bilateral currency swap agreement, extensive financial cooperation and trade deals to import Argentinian cherries and other products has proved a boon for the Latin American country during tough times. 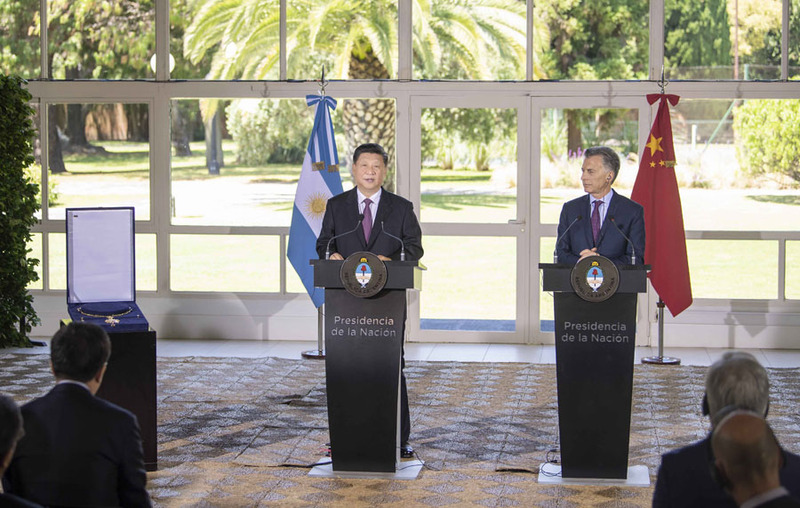 At a press conference, Argentinian President Mauricio Macri declared that China’s presence is not a threat but an opportunity. This evidenced Latin American countries’ recognition of China’s positive influence in the region. Finally, China and Latin America have both demonstrated commitment to improving their people’s lives. President Xi and his Panamanian counterpart Juan Carlos Varela stressed an important consensus during their meeting: upholding the concept of people-centered development. In recent years, to better boost their respective countries’ development, the new generation of Latin American leaders has attached greater importance to building infrastructure, expanding trade with China and promoting exchange of governance experience. These moves have provided a favorable political environment for building a China-Latin America community with a shared future and achieving substantive results in the implementation of the Belt and Road Initiative in Latin America. 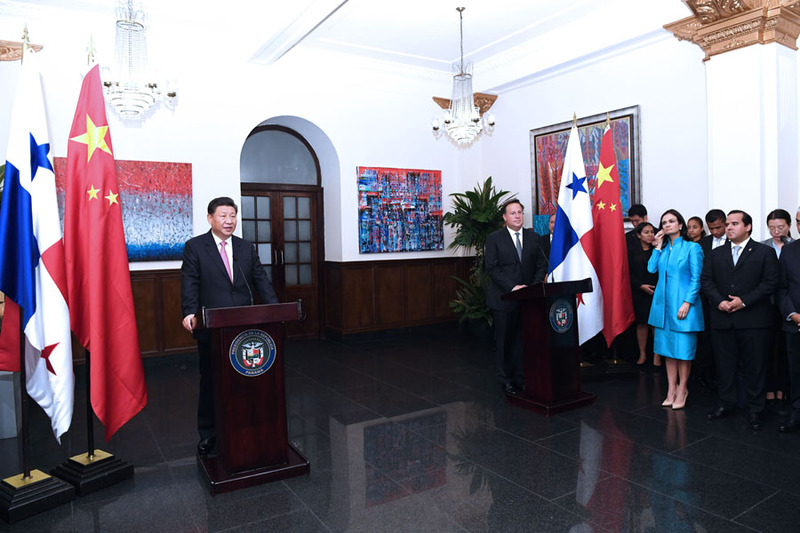 Recognizing the importance of the relations with China, Panama moved to establish diplomatic ties with China in June 2017. In the year and a half since, the two countries have signed a memorandum of understanding on jointly promoting the Belt and Road Initiative and 19 cooperation documents while striving to reach a bilateral free trade agreement. Their bilateral relations have been improving significantly. During his visit to Panama, President Xi expressed China’s willingness to promote the alignment of the Belt and Road Initiative with Panama’s National Logistics Strategy 2030. The Chinese government also encouraged China’s financial institutions to set up RMB clearance centers in Panama, acknowledging that the Panama Canal is a permanent international shipping waterway. President Xi expressed hope to reach a comprehensive, high-level and mutually beneficial free trade agreement through negotiations with Panama as soon as possible. All of these factors are laying a solid foundation for China-Panama relations to become a model for China-Latin America cooperation. The author is vice director of the Center for American Studies under Shanghai Institutes for International Studies.